If your travel plans include a trip between Las Vegas and Grand Canyon National Park, leave the driving to someone else and enjoy the ride. This daily shuttle service between Las Vegas and Grand Canyon National Park operates daily. Guests departing from Las Vegas will be dropped off in Tusayan, just outside the gates of Grand Canyon National Park. Guests departing from Grand Canyon can be picked up either at Grand Canyon National Park Visitor Center/Mather Point, inside the national park, or in Tusayan, outside the park at National Geographic Visitor Center. This shuttle does not include Grand Canyon National Park entry fees. 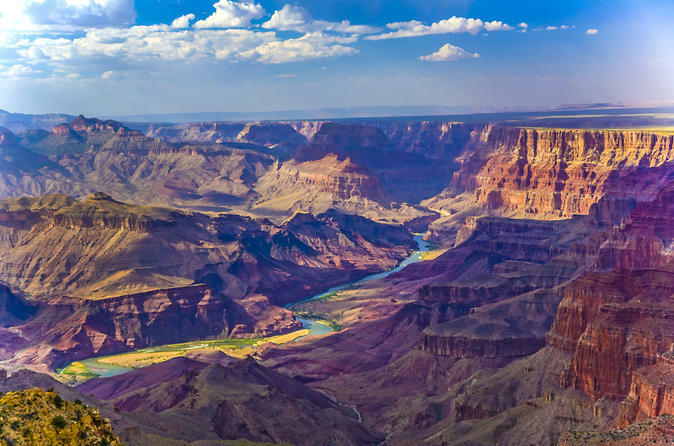 Note: Guests who are going from Las Vegas to Grand Canyon are dropped off in Tusayan, outside of the National Park, will have to pay the entry fees to visit the park. This transfer is a great option if you're planning an overnight trip to Grand Canyon or on a multi destination tour of the southwest. Transfers departing Las Vegas will leave at 6am from 5 designated hotels, arriving around 11am in Tusayan for Grand Canyon. The Grand Canyon daily departure is approximately 2pm with a 7:30pm arrival in Las Vegas, we will drop you off at one of 5 Las Vegas Strip hotels.